Aug. 15 (UPI) — New research suggests sea level rise caused by manmade global warming is likely to increase the risk of devastating tsunamis. Just 12 inches of sea level, scientists at Virginia Tech found, would put coastal communities in greater danger. Climate change isn’t altering the planet’s tectonics, so tsunami-generating earthquakes aren’t likely to become more frequent. But rising global temperatures are melting Earth’s glaciers, accelerating sea level rise, which amplifies the impact of extreme flooding events. When Virginia Tech researchers ran simulations to measure the risk of tsunami-caused flooding, they found sea level rise had a surprisingly large effect. “Our research shows that sea-level rise can significantly increase the tsunami hazard, which means that smaller tsunamis in the future can have the same adverse impacts as big tsunamis would today,” geoscientist Robert Weiss said in a news release. Scientists looked specifically at how rising sea levels would put Macau in danger. Next to Macau lies the South China Sea, home to Manila Trench, a megathrust system that shares many of the characteristics found in the fault systems that produced the 2004 Sumatra-Andaman earthquake and the 2011 earthquake in northern Japan. 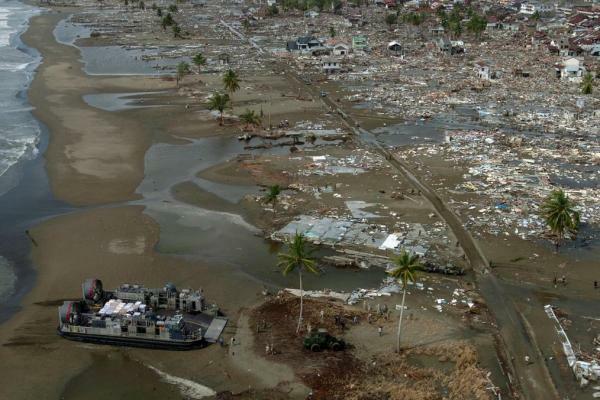 Tsunamis are fairly common, but most don’t have significant impacts. Should sea levels rise 1.5 feet, however, the models suggest the likelihood of tsunami-related flooding in Macau would double. The risk would quadruple if sea levels the South China Sea rise three feet. “The South China Sea is an excellent starting point for such a study because it is an ocean with rapid sea-level rise and also the location of many mega cities with significant worldwide consequences if impacted. The study is the first if its kind on the level of detail, and many will follow our example,” Weiss said. Researchers published their risk assessment this week in the journal Science Advances. The study’s authors said their findings are a reminder that sea level rise’s impact on risk assessments. “We need to study local sea-level change more comprehensively in order to create better predictive models that help to make investments in infrastructure that are or near sustainable,” Weiss said.